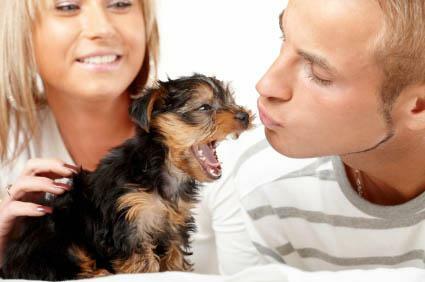 Stopping puppy barking can present a challenge to a new dog owner. A puppy's barking may be cute at first, but without early training the barking can turn into a behavioral issue in an adult dog. Here's what you need to know to stop puppy barking. Wondering how to get a puppy to stop barking? You can help a puppy bark less with a few simple techniques and routine changes. Provide plenty of attention. Keep the puppy with you whenever possible by letting her follow you around the house or take her out on errands. Taking the puppy on errands helps socialize her and will lessen stranger barking. Make sure that the puppy's living environment is comfortable. A puppy may bark if she is too warm or too cold. She should have constant access to fresh water and a soft dog bed. Outdoor dogs need a dog house suitable for all weather conditions. Crate training helps some puppies adjust to new homes faster. Add fleece blankets to make the crate into a soft bed. The crate serves as both a comfortable bed and a safe place when the puppy wants time alone in a busy household. Crate training will also help with house training because the puppy will not want to soil her bed. Teach your puppy the basic commands of sit, stay, heel and no. Teaching your puppy basic commands will help you control many problem behaviors such as barking. Your puppy views your family as her pack and will obey her pack leader. When a puppy accepts a command and obeys it, she is acknowledging you as the pack leader. If she does not view you as the pack leader, she may bark at strangers because she feels it is her responsibility to protect the family. However, if you train her, she will stop barking at the stranger when she hears your command, "no." In deference to you as the pack leader, she stops barking because she trusts you to handle the situation. When you give commands, use a firm voice but do not shout at your puppy. Shouting may frighten a puppy. A firm voice is also more effective than shouting at a barking puppy because the puppy might even interpret a shout of "no" as a bark. If the puppy thinks you are joining her barking, she will bark even more. You can use a spray bottle as a disciplinary aid to train a puppy not to bark. When the puppy barks, lightly spray her in the face. One short spray is sufficient. Use only plain cool water in the spray bottle. You can also use the spray bottle method for other undesirable behaviors such as begging for food at the table. A noise can also help train a puppy not to bark. You can create a noisemaker by filling a coffee can with a few coins and replacing the lid or placing a few pebbles in a soda can and sealing the opening of the can. When the puppy barks, lightly rattle the can somewhere in the same room so that it makes a noise and say firmly, "no." The puppy will not like the noise and will begin to associate it with barking. Shake the can near the puppy but not directly in front of the puppy's face, because that may be too frightening. Please do not make a loud noise with anything that could potentially harm your puppy's ears, such as a horn. Early formal obedience training can also prevent a barking problem. Puppy classes are ideal because dogs learn basic commands and how to socialize with people and other dogs. The classes also teach a puppy how to walk politely on a leash without straining against her lead. If you cannot find a puppy class to fit your schedule, you can always seek private instruction with a professional dog trainer. A dog trainer can help you teach your puppy basic commands and guide you through ways to prevent excessive barking. With time and patience, it is possible to stop a puppy from barking too much. Ultimately, your puppy wants to please you. Gentle guidance can make all the difference in preventing excessive puppy barking.